You know one way that atoms bond together, the Ionic bond, where two atoms oppositely charged attract each other. This is how very similar elements, or same elements, bond together. And they do this by sharing. Remember, each element is try to get to exactly eight electrons on the outside shell. An elemental shell is an imaginary guideline showing how far from the nucleus the electrons are. In the first shell, the closest to the nucleus, only two electrons can fit, because being so close together, a third electron would be repelled away. All the outer ‘shells’ from that can hold eight electrons each, and that is the atom’s goal, to reach eight electrons in it’s outermost shell, unless if the outermost shell is the first one. Let us say that two oxygen atoms float close to each other. Oxygen has a total of eight electrons, two filling up the first shell, and six in the one outside of that, meaning oxygen has two electrons to go before it reaches eight in the outermost shell. When the two atoms (let’s call them, for clarification, O#A and O#B) come almost in contact with each other, O#A begins to attract two of O#B’s electrons, but the electrons are still being attracted by O#B. So, because O#A won’t just let go of “his” new found electrons, O#B “decides” (these are just relative terms, by the way. Atoms don’t ‘decide’ things) to share them with O#A, so both atoms are being attracted to the electrons. In return though, O#B gets to share two of O#A’s electrons. So now, both atoms have exactly ten electrons attracted to them, with eight in the outermost shell. Another thing that can happen is an oxygen atom comes close to a bunch of hydrogen atoms. Hydrogen has a total of one electron, and it needs one more to fill up the first shell. (also the outermost shell, as there are no electrons in the next ‘shell’) So, one of the hydrogen atoms attracts and shares one of oxygen’s electrons, and oxygen attracts and shares hydrogen’s atom with him. Oxygen now needs only one more electron, so it attracts another hydrogen atom, and they share electrons as well. So now we have one oxygen atom hooked on with two hydrogen atoms, written down as H2O. Looks familiar? This entry was posted in Uncategorized on August 29, 2012 by Captain Belaq. Due to popular request (well, one request. I don’t have very many subscribers) today’s post will be about salt, and about how it works as a cleaning agent when used in pools. I know at least two of my subscribers have pools, so here you go. When you open your eyes in a chlorine pool, gradually your eyes begin to sting. This is because of the natural Hydrogen atoms that grab onto the chlorine atoms, which irritate your skin. Using the salt process eliminates this. To tell you the truth, when using salt for your pool, it is still chlorine doing the cleaning for you. Now, salt is composed of sodium and… what else? -Chlorine. The salt is put through a Chlorine Generator, where a finely directed electrical current (called electrolysis) separates the sodium and chlorine, and puts them back in the pool, where most of the chlorine hooks onto oxygen instead of hydrogen, and the rest of the chlorine hooks onto the sodium. Hooked onto the oxygen, the chlorine can still kill bad bacteria, but does not irritate human skin. This entry was posted in Uncategorized and tagged chlorine, pool, salt, sodium on August 28, 2012 by Captain Belaq. You all know about atoms, electrons, protons and neutrons from my previous posts. You may have forgotten, so I’ll give you a quick overview before I go on. In an atom, we have positively charged protons (the number of protons determine the element) in the center, with a same amount of negatively charged electrons being attracted to the protons and floating around. Neutrons (which are not charged at all) fit in with the protons to keep them repelling each other into oblivion. Now on to the subject at hand. You know how I had wrote in previous posts that atoms bond to each other, but I did not say how. Here is one of the ways atoms bond to each other, called the Ionic bond. let’s say we have two elements, Na (sodium) which has 11 protons and 11 electrons, and Cl (chlorine), which has 17 protons and 17 neutrons. The Cl atom and the Na atom come close to each other and Na gives an electron to Cl (I did a blog post on why, and to see it click here). So now Cl has more electrons than protons. Before, when there was a same amount of protons and electrons, the negative and positive charges canceled each other out, but now there is more negative charge, so the whole atom is now negatively charged. Na, on the other hand, just lost an electron, so there is more positive charge than negative, making Na positively charged. Now, as you all know, opposites attract, so the two atoms that are already very close to one another fly together, and we have a bit of salt for our food. This entry was posted in Uncategorized on August 24, 2012 by Captain Belaq. The last two posts were of gems that are not technically stones, but you could still consider them so. I see no reason why not to continue the flow, so today’s topic is Amber. Let’s say there was an ant, scurrying along the trunk of a tree, when it accidentally steps into a bit of resin that is sticking to the trunk. The ant tries to pull free, but is unable. 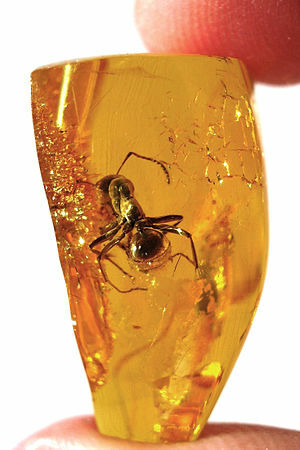 Before it dies of starvation, a drop of more resin rolls down, engulfing the ant. The resin rolls down to the ground and is gradually buried in deep soil, which compresses and sort of hardens that drop of resin. This hardened form is called amber, which you very well may own in your jewelry. And if there is some sort of bug in there, well, that’s a bonus. So there you have it. Amber is that sticky stuff that gets all over you when you try to climb pine trees. All the same, it’s beautiful when not sticking to you. This entry was posted in Uncategorized on August 22, 2012 by Captain Belaq. “Hold it right there” I can hear you say. 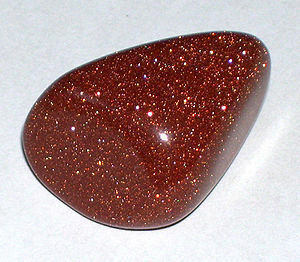 “Gold is a metal, not a stone!” Well, you’re right, but the subject today is not gold, it is the substance goldstone. Notice I said substance, not mineral. That is because goldstone is man-made. According to legend, a couple of monk-chemists were trying to make gold. To make gold, where do you start? With the color, of course. So they got some copper. And then they got a couple other things, and, the result was basically not gold. But, the end result was not useless, rather it was beautiful and sparkly. I don’t know how they made it then, but this is the process today: Silica grains (beach sand, also the primary ingredient for making glass) are mixed with copper oxide and a few other metal oxides. This mixture is placed in an airtight furnace and heated until the silica melts and becomes molten glass. The metal oxides interact with the copper oxide and chemically react to isolate pure, elemental copper. Now the heat is carefully watched, so that it is still hot enough to keep the glass molten, but not so hot that the slowly forming copper crystals oxidise or melt. Once the crystals seem to be at their prime, the furnace is slowly cooled down and the large mass of glass is brought out and inspected for the best and highest quality parts, which are gently whacked off and sent to jewelers all around the world. Even though this ‘stone’ is man-made, I do not feel like it is an imposter, rather a stone that is one of the semi-precious gemstones, not a lowly quartz pebble, and yet content not to be one of the precious gemstones. This entry was posted in Uncategorized and tagged goldstone on August 21, 2012 by Captain Belaq. Do all Oysters have pearls in their shells? How does a pearl help the oyster? Does it? How does a pearl form? Here are the answers to those commonly asked questions. It starts out when an oyster is just sitting there, sucking in food that is floating around in the ocean (you know, algae, little pieces of rotten meat, or whatever oysters eat), when in comes a piece of sand or debri and gets stuck inside the shell. Oysters are sanitary creatures, and they sure don’t want anything contaminating their food, so, they secrete calcium carbonate (same thing the shell is made of, and also known as nacre) over the debri, totally encasing it with the hard substance. Then, along comes a pearl diver, grabs the oyster and opens it up to get the pearl. Nowadays, people culture oysters in oyster farms and put a grain of sand into the oyster’s shell, and come back a few years later to collect the pearls. 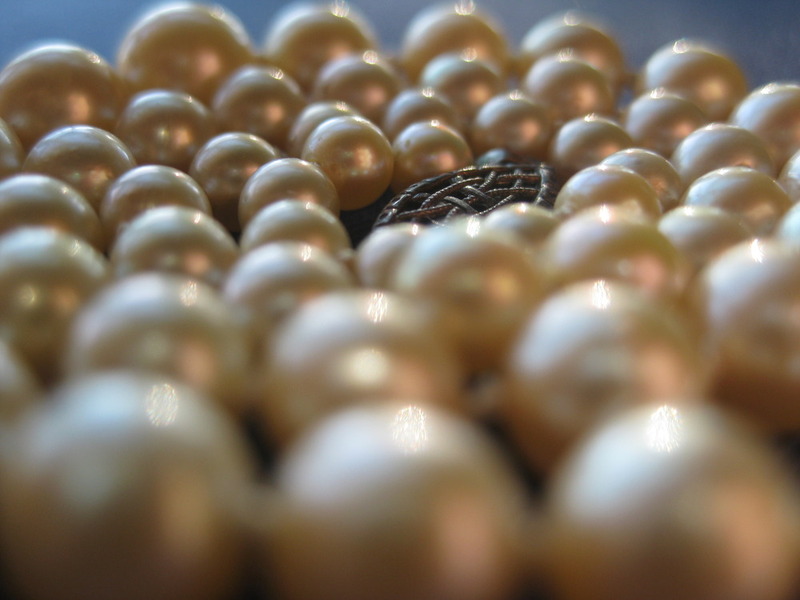 Pearls that are not pefectly round are called baroque pearls, and are worth considerably less than pearls that are perfectly spherical. I bought a string of 70 baroque pearls for $3 at a gem show, and even though they are not valuable, they are beautiful, some having little points on them. What many people do is put tiny statues inside instead of sand grains, and the nacre forms over the ridges and carvings, forming a pearl replica of the statue. This entry was posted in Uncategorized on August 15, 2012 by Captain Belaq. Have you ever seen fire agate? It is a sort of murky reddish brown, and, bursting out of that murkiness, are hills of fire, displaying the same kind of fire that is present in precious opal. 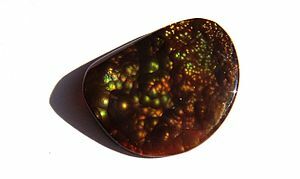 I have seen some carvings and pictures of carvings in fire agate, and it is gorgeous! What is interesting though, is that the only agate that has this fiery iridescence also is very murky brown, as I said before. Now, before I go on, try to guess what that reddish-brown color is due to. If you guess it correctly, without reading ahead, you get a, um, a “good job”. So, guess the answer, scroll down to the comments without reading ahead, and comment your guess. Okay! Time’s up! The answer is… (look away if you have not yet commented) Iron oxide, A.K.A Iron rust. Good job if guessed correctly. Now back to the color. The opalescence (So called because the color is produced the same general way as opal’s color) is produced when silica fluid (basically agate dissolved in water) flows into a hollow, starts hardening, then some Iron Oxide flows in on top of that, and it alternates, forming little bubbles. Because of the alternating agate and rust, the light bounces around considerably, coming to your eye in different wavelengths. This entry was posted in Uncategorized on August 14, 2012 by Captain Belaq.